SINGAPORE - Meritocracy has worked, helping generations of Singaporeans advance in their lives, but it cannot be left to its own devices, Emeritus Senior Minister Goh Chok Tong said on Wednesday (Nov 21) as he urged a roomful of Singapore's movers and shakers to give to charity. 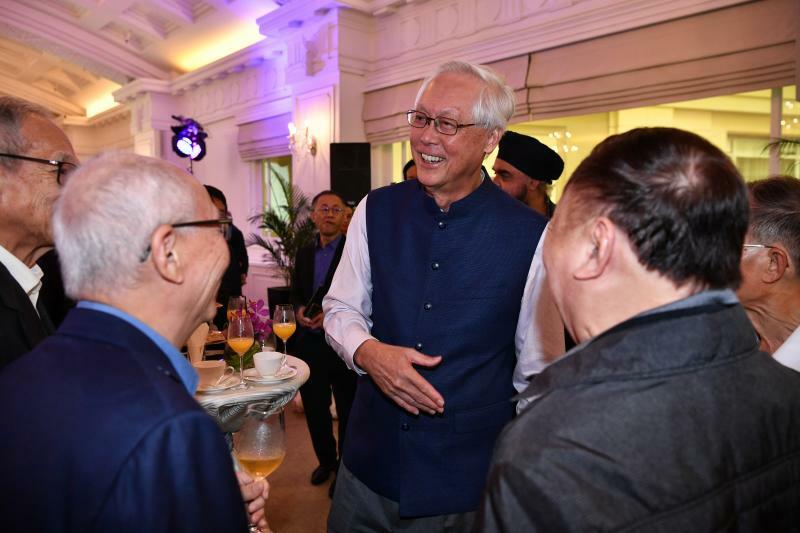 He is one of its beneficiaries, having received a government bursary that paid for his university education, he told about 150 donors and guests at the charity launch of his biography, Tall Order: The Goh Chok Tong Story. "My life turned out well, not just because of my own effort but also because of our practice of meritocracy. I did not have to rely on 'guanxi'," he said, using the Chinese word for connections. "I had equal opportunities to study, compete, get a job and do well on my own steam." Many in his generation similarly enjoyed meritocracy and social mobility that was put in place by the Government and nurtured by society, he added. "Many of you here walked that journey too. But meritocracy cannot be left to its own devices. We must constantly adjust to maintain an open system with opportunities for all Singaporeans to advance themselves." While his journey, as detailed in the book, manifests the merits of meritocracy, Mr Goh said he had a national motive for agreeing to the authorised biography. He wanted to encourage younger Singaporeans to step up and serve the country, just as his generation did. Tall Order, hence, explains the intricacies of Singapore's first planned political succession. Mr Goh, who succeeded founding prime minister Lee Kuan Yew in 1990, headed the Government for 14 years. After he stepped down, he took a ground-up approach to help disadvantaged Singaporeans. "I look for gaps in our society where they may fall through," he said. "You are here today because of that,'' he added as he urged them to contribute to two charitable funds: Marine Parade Leadership Foundation (MPLF) and Today Enable Fund. Donations from the guests, mostly business and government leaders, as well as all royalties from the book sales will go to the two charities. Mr Goh founded MPLF nine years ago, and Today Enable Fund - which has been renamed the Mediacorp Enable Fund (MEF) - with Today newspaper in 2016. The MEF, which has raised more than $1 million, supports people with disabilities and special needs, while the MPLF encourages and trains young Singaporeans from Marine Parade and the surrounding constituencies to serve the community. Mr Goh said he recently started a programme called EduGrow under MPLF and its aim is to help disadvantaged students do better. Through the MEF, he hopes people with disabilities get the opportunity to maximise their potential through early intervention beyond the financial reach of their families. In his typical quiet humour, he told guests at the launch: "I am certain that the social dividends from your donations will far exceed the yield on your fixed income investments." The book launch was held at Fullerton Hotel, a building with deep memories for Mr Goh. Much of the early years of his career was spent at Fullerton Building where he worked at the Finance Ministry. He recounted: "Here, I literally worked my way up, from the second floor to the top floor where my offices were at different times, and in my civil service career." The building was also where Neptune Orient Lines, which he headed for several years, was born, and also where he started his political journey as Senior Minister of State for Finance. "And my final reason for choosing this place? I officially opened the Fullerton Hotel as Prime Minister on 1 January 2001," he said. Mr Goh presented signed copies of the book to 12 donors who had contributed $50,000 each. They included the Ng brothers, Robert and Philip, whose family owns Fullerton Hotel, Mr Edmund Koh, president of private bank UBS Asia Pacific and Mr Ng Kok Song, former chief investment officer of national sovereign fund GIC. Mr Goh also presented a $2 million cheque to MPLF and SG Enable, which manages MEF.